Thank you for your interest in the SURE-VENT line of Ventilation and Rescue Chain Saws equipped with our new SURE-VENT "RAZorback" Carbide Insert Fire Department Type Cutting Chain. Many years of chain saw and two stroke engine experience and many months of testing have gone into the development of the SURE-VENT Saw to be the best tool in your arsenal for roof venting and wall breaching. From the beginning, our concern has been with the Firefighter. One of the most dangerous jobs he encounters is roof venting. We design tools to get the job done as safely and quickly as possible and get him back off the roof. 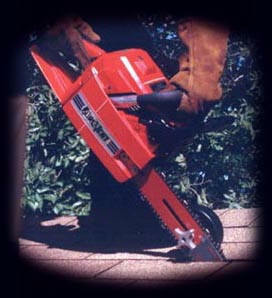 Our Saws are Fast Starting-Hard Working-Long Lasting. We offer our exclusive "Roller Guide" (patent # Des 341,309) to help eliminate cutting the rafters and we use the best carbide insert chain developed for firegrounds use. Many components are manufactured in house by SURE-VENT Ltd. to give you a system unequaled by anyone else. Please take time to look over this web site and you will see that we have the best cutting tools for your needs plus the service to back them up. Eldon Hammond, President SURE-VENT Ltd.